Hopelessly Devoted Bibliophile: A giveaway just for all you WRITERS out there! I am one of the minority it seems, in the book blog world. I'm just a reader, not so much a writer. Well, unless you count the copious ramblings I shoot off on here semi-daily? Then, perhaps. Without YOU however my friends, those people who love to spin a good tale and put it up for others to enjoy, there would simply be nothing for me to read. So, I salute you! I also want to help. That's why when I was approached by Prufrock Press to review Seize the Story: A Handbook for Teens Who Like to Write, I asked them instead if I could offer up those copies to all of YOU! They sweetly said yes. Lucky ducks, you. 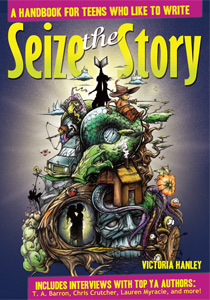 Up for grabs are 3 (yes THREE) copies of Seize the Story: A Handbook for Teens. You must be in the U.S. or Canada to win! Good luck! The giveaway ends October 28, 2011.